Image from the referenced NIST paper: A scanning AFM tip detects the expansion of the underlying material in response to absorption of infrared light. There have been several recent exciting publications by nanoIR users in a number of growing applications areas. These include plasmonics, health care, fuel cell membranes and polymer nanostructures. Three of these publications are reported here. Nanoscale Imaging of Plasmonic Hot Spots and Dark Modes with the Photothermal-Induced Resonance Technique. The lead author is Dr Andrea Centrone from NIST, USA. 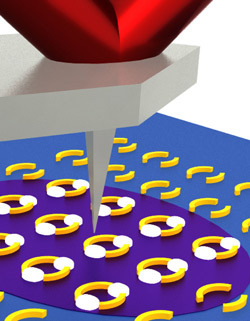 In this publication from NIST, the AFM-IR technique is applied for the first time to image the dark plasmonic resonance of gold asymmetric split ring resonators (A-SRRs) in the mid-infrared (IR) spectral region with nanoscale resolution. Additionally, the chemically specific PTIR signal is used to map the local absorption enhancement of poly(methyl methacrylate) coated on A-SRRs, revealing hot spots with local enhancement factors up to ≈30. Nanoscale infrared (IR) spectroscopy and imaging of structural lipids in human stratum corneum using an AFM to directly detect absorbed light from a tunable IR laser source. The lead author is Dr Gustavo Luengo of L'Oréal, France. Samples of normal and delipidized stratum corneum were studied in this work by L'Oréal together with researchers at Anasys Instruments. This shows substantially less long-chain CH2 -stretching IR absorption band intensity than in normal skin. AFM-IR images that compare absorbance values at 2930/cm (lipid) and 3290/cm (keratin) suggest that regions of higher lipid concentration are located at the perimeter of corneocytes in the normal stratum corneum. Morphology of water transport channels and hydrophobic clusters in Nafion from high spatial resolution AFM-IR spectroscopy and imaging. The lead author is Dr Tadashi Awatani from Nissan ARC in Japan. The nanoscale distribution of distinctly different water molecules within a perfluorinated sulfonic acid polymer Nafion film has been chemically imaged for the first time. Chemical imaging results have revealed ionic bound water molecules, iH2O, (3211 cm-1) that were clustered in domains, while the hydrated free bulk-like water molecules, bH2O, (3482 cm-1) were found within transportable channels that linked these clusters. A direct visual insight of the Nafion water structure given by this method will enlighten the understanding of the present proton exchange mechanism that is essential for the development of more efficient fuel cells. For a full list of applications papers on nanoIR, please visit www.anasysinstruments.com/applications/nanoir-spectroscopy. *AFM-IR is a product from Anasys Instruments, Inc. For more information on AFM-IR and its applications, please visit the Anasys web site: www.anasysinstruments.com.